If you contact us by e-mail through the Site, we may keep a record of your contact information and correspondence, and we reserve the right to use your e-mail address, and any information that you provide to us in your message, to respond thereto. In addition, on rare occasions, we may send by e-mail important administrative information regarding the Site or services to users who have provided us with their e-mail addresses; because this information may be important to your use of the Site, it is not possible to “opt out” of receiving these e-mails. The Site is not directed to children under thirteen (13) years of age, and Absolute Trust Counsel does not knowingly collect personally identifiable information from such children. If you are younger than thirteen, please do not provide any personally identifiable information while using the Site. Generally, we will not disclose personally identifiable information that we collect through your use of the Site to unaffiliated third parties. We reserve the right, however, to provide such information to our employees, contractors, agents, and designees to the extent necessary to enable them to perform certain Site-related services (e.g., web hosting, improve Site-related services and features, or maintenance services) on our behalf. We also reserve the right to disclose such information to any third party if we believe that we are required to do so for any or all of the following reasons: (i) by law; (ii) to comply with legal processes or governmental requests; (iii) to prevent, investigate, detect, or prosecute criminal offenses or attacks on the technical integrity of the Site or our network; and/or (iv) to protect the rights, property, or safety of Absolute Trust Counsel and its affiliates, their partners, and employees, the users of the Site, or the public. 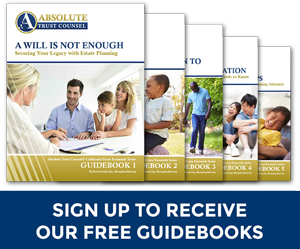 If you would like to change your personal information, or if you no longer wish to receive materials from us or want your personal information removed from Absolute Trust Counsel’s database, please contact us at info@AbsoluteTrustCounsel.com. Alternatively, when you receive materials from us by e-mail or other communications you can make use of the “opt out” provision in such communications so that we know that you no longer wish to receive such materials from us. Absolute Trust Counsel seeks to adopt commercially reasonable security measures consistent with legal industry practice to assist in protecting against the loss, misuse, and alteration of personally identifiable information which is under our control. Unfortunately, no security system, or system of transmitting data over the Internet, can be guaranteed to be 100% secure. As a result of the foregoing, while we undertake commercially reasonable efforts to protect your personally identifiable information, we cannot guarantee the security of our servers, the means by which information is transmitted between your computer and Absolute Trust Counsel ‘s servers, or any information provided to us or to any third party through or in connection with the Site. You provide all such information entirely at your own risk. Absolute Trust Counsel reserves the right to transfer any and all information that we collect from users, or that we otherwise collect in connection with the Site, including, without limitation, to unaffiliated third parties or third parties in the event of a sale or transfer of assets or of any portion of our business. If you have any questions or suggestions about our privacy practices, or you wish to update or correct any personally identifiable information that you have chosen to provide us, please feel free to contact us at info@AbsoluteTrustCounsel.com.